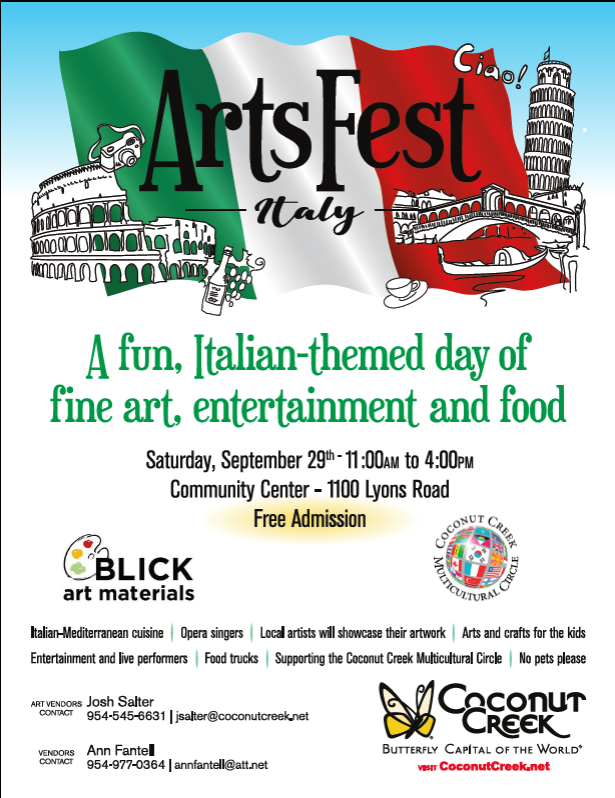 The City of Coconut Creek is pleased to present ArtsFest, a family fun day of fine art, entertainment and food trucks on Saturday, September 29th from 11:00 AM to 4:00 PM at the Community Center located at 1100 Lyons Road. Local artists will be showing off their artwork, arts and crafts for the kids, entertainment and live bands, food trucks and much more. This year’s theme is Italy. This annual event supports the Coconut Creek Multicultural Club. Attendees will enjoy live entertainment by an opera group, Nonstop Dance Company, and Bob Folse (guitarist). Admission is Free to the public. No pets please. 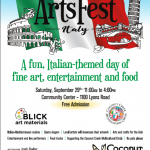 To be an art vendor please contact Josh Salter at 954-545-6631 or jsalter@coconutcreek.net. To become a vendor, contact Ann Fantell at 954-977-0364 or annfantell@att.net. For more information about this event, call 954-545-6670 or visit us at www.CoconutCreek.net.